When you are installing plasterboard in a room, always start with the ceiling. The reason for this is that the plasterboard sheets on the sidewalls will be supporting the edges of the ceiling plasterboard sheets, so it is much easier to install the ceiling first. The ceiling is also usually the hardest area to cover, and this way you get the worst part over with right away. The metal substructure consists of wire with eyelet, anchor – fix rapid hanger, UD 28/27 track profiles, CD 60/27 channel profiles, cross and profile connectors.•The heights of hanging should be marked and the UD track profiles should be fixed with suitable screws and dowels. On the raw ceiling the points of fixing should be marked and the wire with eyelet should be fixed with suitable metal anchor nail 6/35mm. The anchor – fix – rapid hanger should be put in the wire with eyelet. The bearer profile should be hanged on the rapid hanger. Moving the hanger along the wire with eyelet makes the leveling of the profiles. 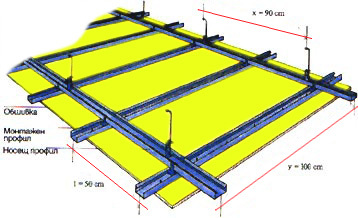 The cross connector with the bearer profiles connects the installation profiles and the distance between the axis should be 50 cm. Two anchor brackets might replace the cross connector. Before furring the construction should be leveled horizontally. Start covering the ceiling in one of the corners, and try to begin with a full sheet. If heat insulation is needed the usage of glass wool RIVATHERM is recommended. The glass wool must be dry for good heat insulation. That’s why a steam barrier is made by insulating the interior warm side of the ceiling. For steam barrier use PE foil or aluminum foil. The boards are screwed with self taping screws over the installation profiles. It is recommended to use a drywalling screw driver. During this process the longitudinal edges of the boards should be placed across the profiles. The joints between the crosswise edges of the boards should not be dislocated. There is no screwing with the UD track profiles. Before you apply the joint tape and finish totally the ceiling, you will be installing the plasterboard sheets on the walls.